Subject: Gaps? Just one, or lots of them? Having gameplay issues regarding Gaps. Players seem to be able to just keep pulling away and creating gaps all over the field. With no way to respond if the first car behind the puller-away doesn't draft, we are left with huge gaps all over the place and no one can catch up. Can someone provide some more detailed clarification regarding gaps? The most important rule for closing gaps is cooperative passing. If a player passes a car that has a gap in front of him, then the car being passed can declare that they are cooperating to fill the gap. The gap is filled by the passing car and NO GAP is created behind the car passed, all cars close in. Yea, maybe a little more cooperation would have helped but unfortunately, for the most part, there were no cars to pass. There were gaps between every car except the front 2 or 3 so, it seemed, the only way to close the gap was to find more pull away cards which seemed to be far more plentiful at the beginning of the game then in the middle, unluckily. Honestly, we came on here in the hopes we've done something blatantly wrong that, by rectifying, will improve the game play in the future. Sorry for the size, it was the quickest way i saw to visualize it. Again, hoping to find something blatantly obvious that we did wrong. Looking through the images I don't see many if any game pictures where the field is so spread out with not much really for anyone but the first two cars to do. I guess if we had a yellow flag it would have closed all the gaps but really, the result of this game was determined by qualifying order more than anything else. That is one ugly race that occurred, and uncommon. The important thing is to draft pull aways when you can and if the above happens hope for a yellow flag. Also, if you are a gap or two back, and there is a car a gap or two back from you, we have some game groups that have adopted a house rule when a player can ease off the gas, drifting back one gap per action. This way a player can drop back, pick up some drafting help and try to chase down the leaders. This rule will be an advanced rule in the new rules set when finished. Remember, a yellow flag removes all gaps. In shorter races, you may not get one, but in longer ones they will most likely occur, so all those Pull Aways to create space become moot. (...) we have some game groups that have adopted a house rule when a player can ease off the gas, drifting back one gap per action. So, in the new advanced rules, a player can drift back one gap per action, without using a card to do so? That creates a gap where he was, right? 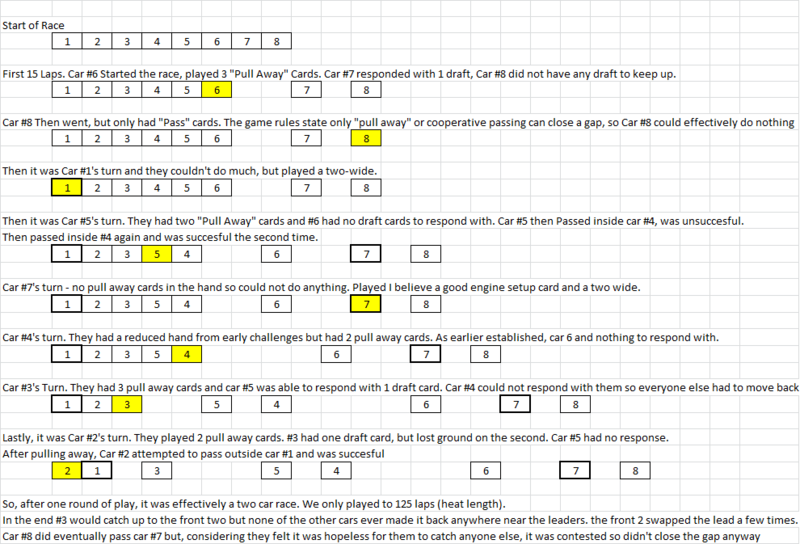 Car5 could then, if he still has an action left, play a Pull Away and hope Car6 drafts, or end their turn. Then, Car6 during their action phase, can pass and fill a gap with Car5 cooperating. Car5 and Car6 will need to play leap frog and/or Pull Away-draft, but can more quickly catch the LEAD DRAFT together as it opens up more options. Stock Car racing requires working together, but knowing when to break off and go it alone for the win. -Provided there's a single car in front of it, move both cars forward, filling a gap and creating a gap at the same time. -Bump Draft: a Pull Away can only be used when there a SINGLE car or NO car in front of you, moving the car(s) forward and creating a gap (Draft card allowed as usual). It was interesting and it provided great moments: limiting the Pull Away made the pack more tight, but the Slingshot Draft balanced that allowing more opportunities. I'd like to playtest these variants again soon. If Car 1 Plays a pull away, can Car 2 still "Draft" even though he is 2 GAP's behind, in order to, at least, maintain the current GAP? Or can you only draft when you are physically linked with the car in front of you? You may only draft when you are physically linked with the car in front of you. Hmm. That makes the mechanic of the game a little more troubling then, as a player effectively has no way to respond to an opponent playing a pull away card in a gap or slow traffic situation, allowing free pulling-away throughout the event. This makes the game we started with above even less palatable for those who were put at gaps of 2, 3, 4 spots early on, as they would spend the whole game just hoping to get more 'pull away' cards than the car in front of them, with literally zero other cards in the hand being relevant to them at any given time. No pull away, no play. If opponent pulls away, it just gets that much harder if you can't match their speed. Are we missing something here? Short of just waiting for a yellow flag and hoping for the best? With 6+ players we usually have a 2-lane racing. This changes the whole picture and changing lanes becomes another way to position your car. You had a peculiar race the way you described. If that happened in our league, before another Pull Away hits the table we would already start our table-talk, trying to persuade a few drivers to allow cooperative passing to fill gaps and such. But, in essence, you are right. A player has no way to respond to an opponent playing a Pull Away in front of a slow traffic or gap. Hi - just wondering where players who have this game get a copy of the "new advanced rules"? As far as I know it's a work in progress. Anyway, I'm compiling all this info and trying to create a concise version for our group (and I may upload it here if there's demand). Even if ppl don't use them, they will surely want to review them. In fact, I do have everything compiled... in Portuguese. I'm now translating what I have into English, and this is taking me some time (after all, English is not my primary language). Considering this, a review will be in order. Or is not allowed to play pull away because there is no gap for him to go into. Yes, he's allowed to play it.